On December 11, the Permanent Synod of the Ukrainian Greek Catholic Church began its meeting in the Patriarchal House in Lviv. The Sixty-Sixth (57th) Session of the Permanent Synod began with the Divine Liturgy headed by the Father and the Head of the UGCC His Beatitude Sviatoslav in concelebration with the members of the Permanent Synod: Metropolitan of the Przemysl-Warsaw Yevhen Popovich, Eparch of Paris Borys Gudziak, Eparch of Parma Bohdan Danylo, Assistant Bishop of Ternopil -Zboriv Theodor Martynyuk, and also the secretary of the Permanent Synod of Bishops Bohdan Dziurakh. At the end of the Liturgy, the UGCC Primate congratulated all those who arrived at the Permanent Synod, just as the chaplains of the penitentiary institutions, who on that day held their formative seminar at the Patriarchal House. In his speech, addressed to the members of the Permanent Synod at the beginning of the working meetings, His Beatitude Sviatoslav thanked the Bishops for this opportunity of a joint action "for the good of our Church". On the first day of the working meetings, the Permanent Synod devoted a lot of time to in-depth analysis of the Synopses of the Synod of Bishops in 2018, which took place in Lviv on September 2-11, and in particular the implementation of synodal decisions devoted to the main theme of the Synod - "Catechism and the Word of God." 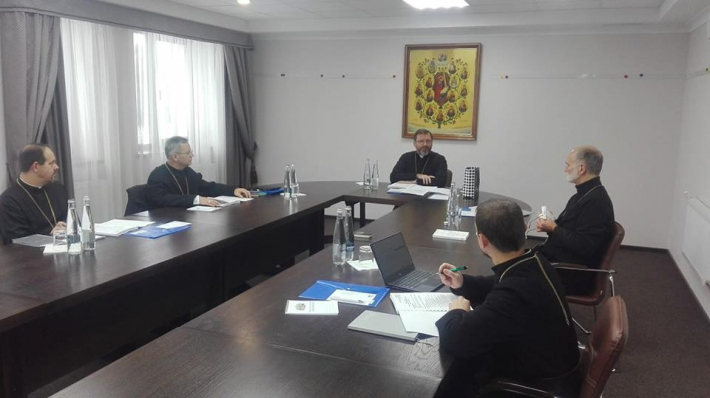 In addition, the necessary decisions were taken to prepare the next Synod of Bishops whose main theme would be "Communion in the Life and Testimony of the UGCC". By tradition, the Permanent Synod has listened and analyzed reports of executive structures of the patriarchal level. At this session, Bishop Yaroslav Pryriz, head of the Theological Department, as well as Mrs. Olesia Kolos, secretary of the Council for Evangelization under the Head of the UGCC, reported. The status of implementation of the Strategy for the Development of the UGCC for the period up to 2020 was reported by the working group led by Bishop Ken Novakivsky. On Wednesday, December 12, the Permanent Synod will continue its work. Among other issues will be discussed the development of the Department of External Church Relations, the Financial Strategy of the UGCC and the establishment of the Holy Brotherhood of Divine Mercy.